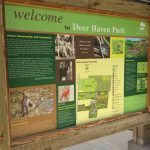 Each park’s exhibit has a different focus, at Deer Haven park birds rule – not only inside the nature center but also at the feeders outside. I did see a racoon sneak by though during my visit, but that’s a different story. When you walk into the nature center, a friendly volunteer greets all visitors, explains that following last year’s Ice Age and dinosaur-era exhibit, this year’s exhibit showcases the only non-extinct dinosaurs, birds. 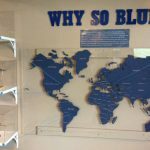 The first display highlights blue birds from all over our Blue Planet. 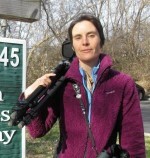 A hummingbird from Brazil, a jay from Mexico and an Indigo Bunting from the USA. 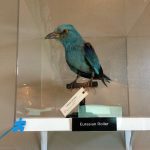 The oh so blue Cerulean Warbler greets people at the entrance desk. 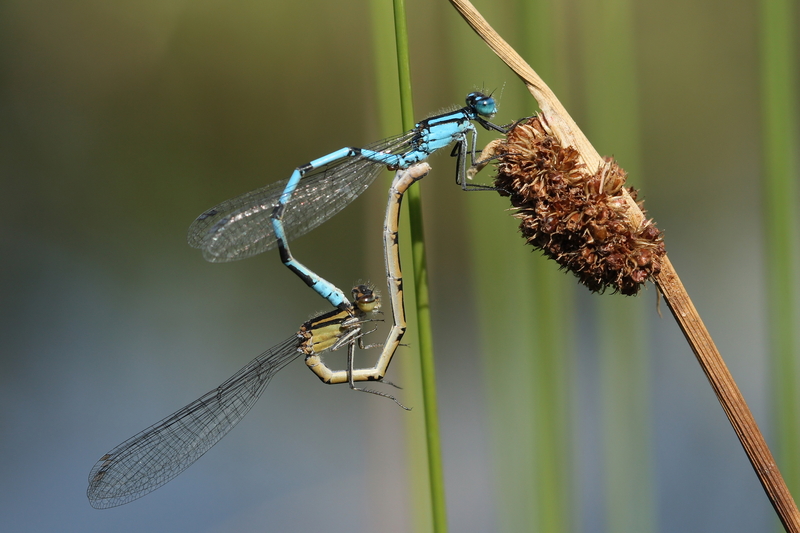 Further you will find differently shaped bird wings which allow speedy flight in some and gliding in others. 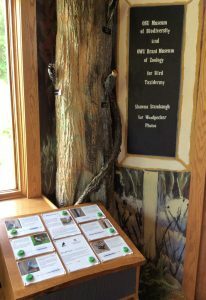 The sound kiosk with various drumming patterns of woodpeckers and a snippet from BirdNote, a nonprofit radio program dedicated to the conservation of birds and their habitats, is tucked in the corner right next to the “window on nature” with great looks at various bird species visiting the numerous feeders. A Ruby-throated Hummingbird landed during my visit and drank leisurely from the provided sugar water solution. 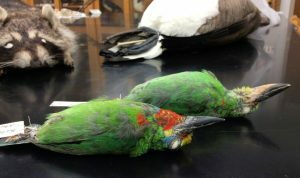 In the neighboring room, bird skulls illustrate and highlight the enormous variability in size and shape among birds. Compare a hummingbird skull to a Bald Eagle! 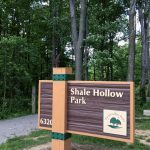 Shale Hollow park is only a short drive south from Deer Haven, you actually pass it on your way back to Columbus. 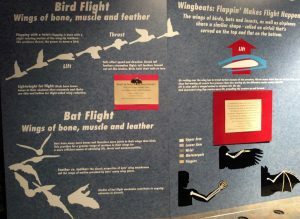 The exhibit is well worth a stop: Enter a darkened room to learn about bats, fireflies and moths! 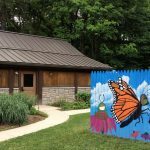 Insects and bats are the theme here, including butterflies (a tent with life butterflies is soon to open!). 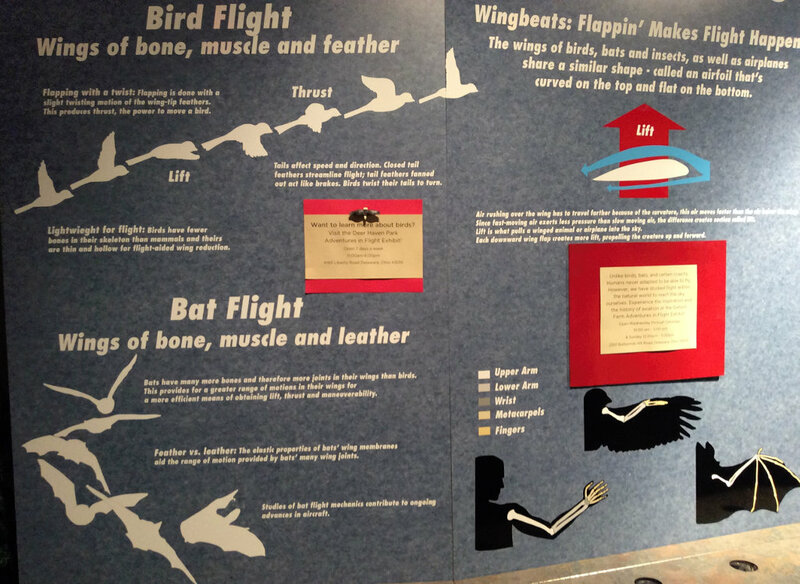 A poster gives basic information about the anatomy of flight and why some animals fly and we do not – at least not using our arms as wings, we built machines to take us into the air. 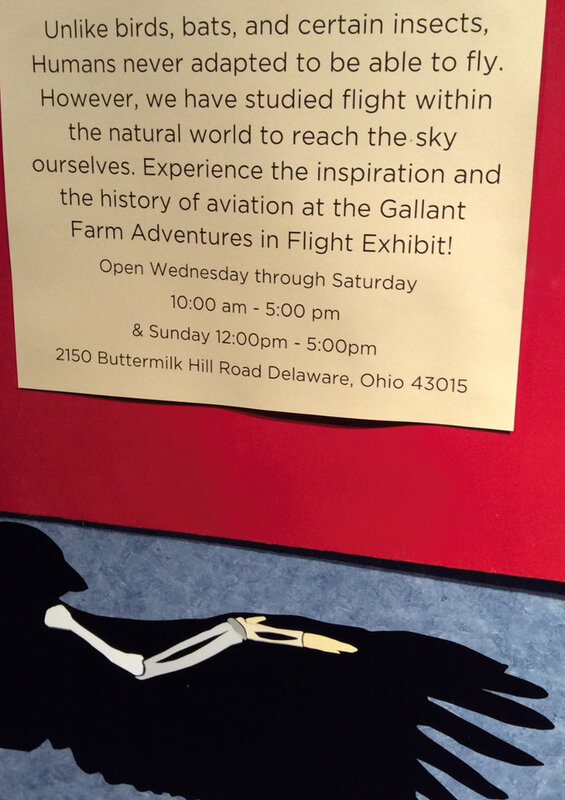 To explore man-made flight visit the third of the exhibits at Gallant Farm. Can you guess what’s inside this flower? 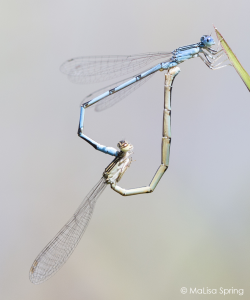 On my way out I discovered a microscope for smartphones – obviously I still have to practice perfecting my images, but you can guess the intricate patterns of this dragonfly’s wing. I really enjoyed the exhibits which also showcase specimens from the Natural History Museum at Ohio Wesleyan University. 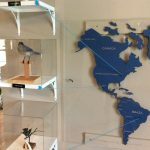 Thank you Liz Neroni for working with us on these displays and letting some of our specimens be part of this exciting summer exhibit – and of course there are plenty of opportunities to enjoy the outdoors while you visit each of these exhibit sites. Enjoy! About the Author: Angelika Nelson on her last assignment as the social media outreach manager for the Museum of Biological Diversity. 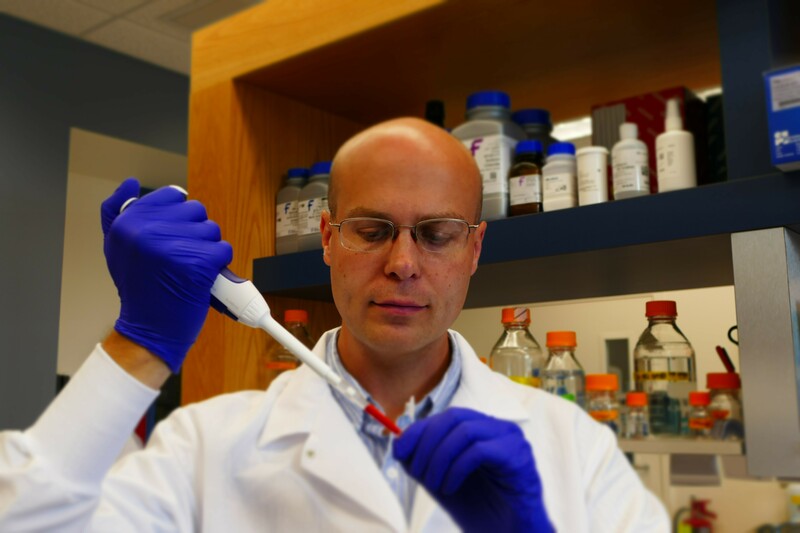 Brandon Sinn, PhD graduate from the OSU herbarium, now a postdoctoral fellow at West Virginia University, recently published a paper on molecular work he did to better understand the evolution of genomes in Asarum (Aristolochiaceae), commonly known as wild ginger. The work was done in collaboration with Dylan Sedmak, an OSU undergraduate student, Lawrence Kelly, Associate VP of Science, New York Botanical Garden and John Freudenstein, Professor and Chair of EEOB and Brandon’s PhD advisor. 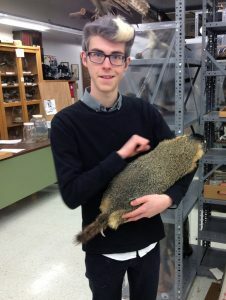 Brandon: “Evolutionary relationships in the flowering plant genus Asarum served as the focus of my dissertation research, and I continue to study the group. 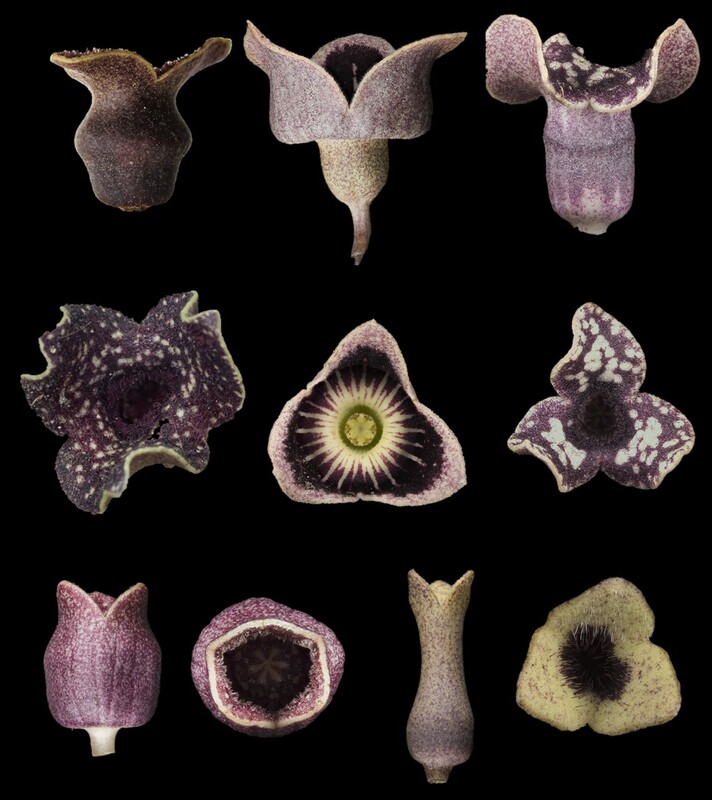 In this particular project we studied six Asarum species, which each represent one of the six major evolutionary lineages within the genus. Asarum is a poorly-understood genus of approximately 115 species found in temperate forests across Asia and North America. Some Asarum species are common and widespread across the continents where they are found, while the majority have highly restricted ranges – for example, one species is known only from a single gorge in North Carolina and others are found in only a few counties in the southeastern United States. This lead to the following research questions: Note: A plastome is the genome of a plastid, the organelle responsible for photosynthesis in plants. 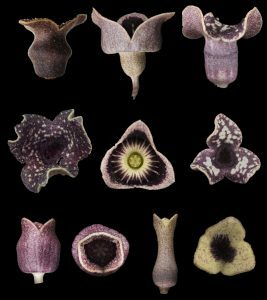 1) Have the plastomes of all Asarum species been destabilized and their gene order rearranged? 2) Is the plastome of Saruma henryi (commonly called upright wild ginger), the closest relative of Asarum, of typical arrangement or is it more like that of Asarum? 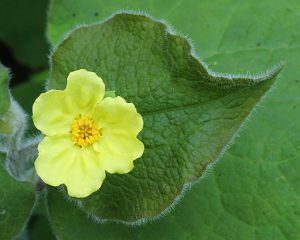 3) Can we understand how the ordinarily highly conserved and stable plastomes become destabilized by comparing the plastomes of many Asarum species to that of Saruma henryi? What should we know to understand this research? 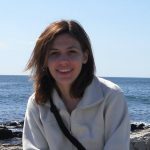 What method did you use to study your research question? A cruciform DNA structure that has likely destabilized a region of the plastome in Asarum species. The end of the ndhF gene is shown in red. Structure courtesy of Eric Knox. DNA is made of only four chemicals (which we abbreviate as the letters A, T, C and G) and is not entirely unlike a spiral staircase, where each handrail is a string of these letters. Holding this structure together are bonds that form between certain letters – A-T and G-C. We call these letters nucleotides. Sometimes the nucleotides making up DNA cause the molecule to form complex shapes, such as the cruciform structure shown here. Cruciform, or cross shaped, DNA structures form when the same nucleotides are repeated very close to one another, which is depicted in the vertical “stems”. What should you take away from these findings? 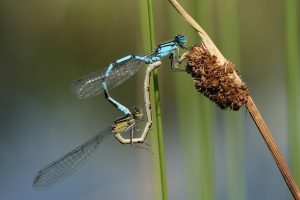 1) Just because a species is a member of a very old evolutionary lineage, we should not expect that it is a living fossil and that its genome has changed little. 2) A plastome can function even when gene order is changed and more than half of its genes are present more than once. 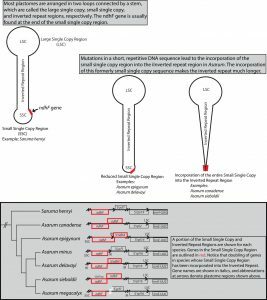 3) Small, likely randomly generated repetitive motifs in DNA sequence that is not part of a gene can decrease genome stability, and lead to genome rearrangement and gene duplication. Wow, we are now certainly asking questions and getting answers with new techniques that we could not have imagined decades ago. 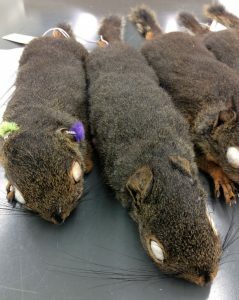 If you want to follow Brandon’s further research, click here. About the Authors: Brandon Sinn earned his Ph.D. in 2015 from the Department of Evolution, Ecology and Organismal Biology, where he was a member of the Freudenstein Lab in the Museum of Biological Diversity. 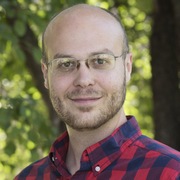 Brandon has held a postdoctoral research position at the Pfizer Plant Research Laboratory of the New York Botanical Garden, where he worked on the Planteome Project. 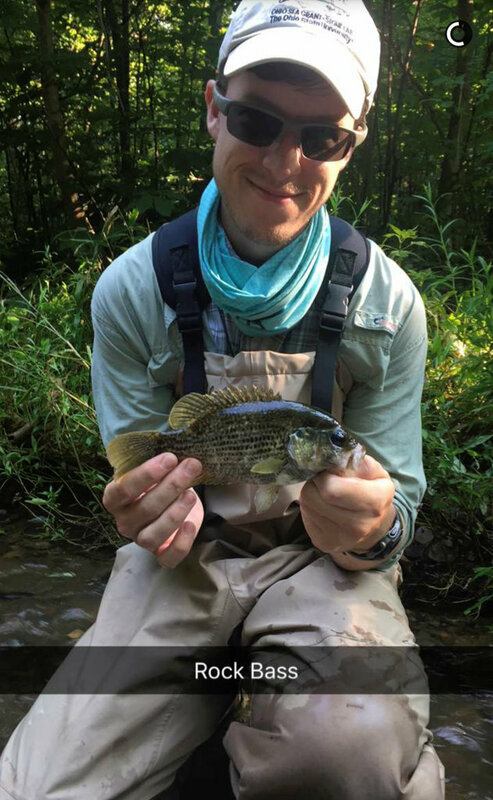 He is currently a postdoctoral fellow in the Department of Biology of West Virginia University where he studies orchid genome evolution as a member of the Barrett Lab. 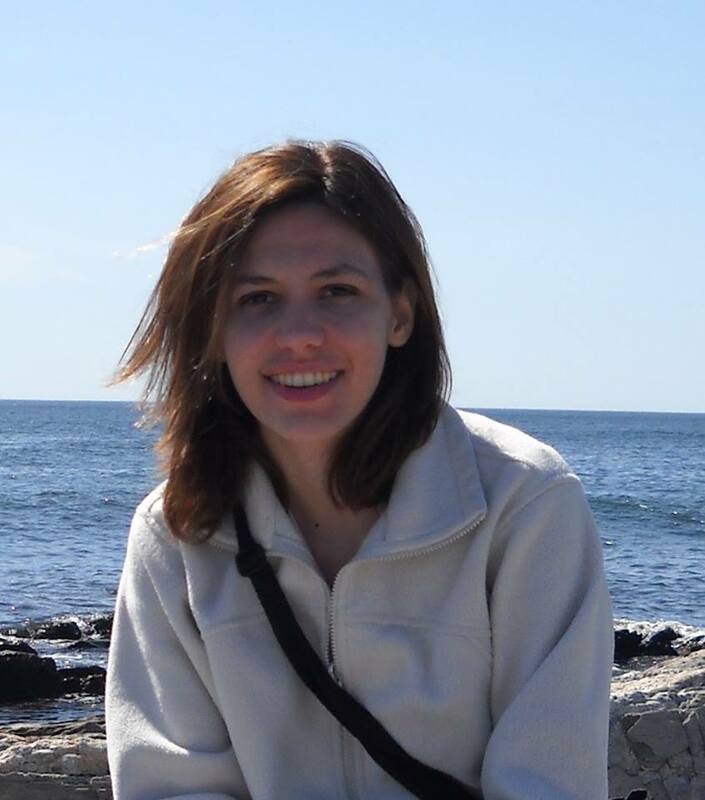 Angelika Nelson is the curator of the Borror Laboratory of Bioacoustics and the social media manager for the museum. Follow us also on Facebook. Sinn, B. T., Sedmak, D. D., Kelly, L. M., & Freudenstein, J. V. (2018). 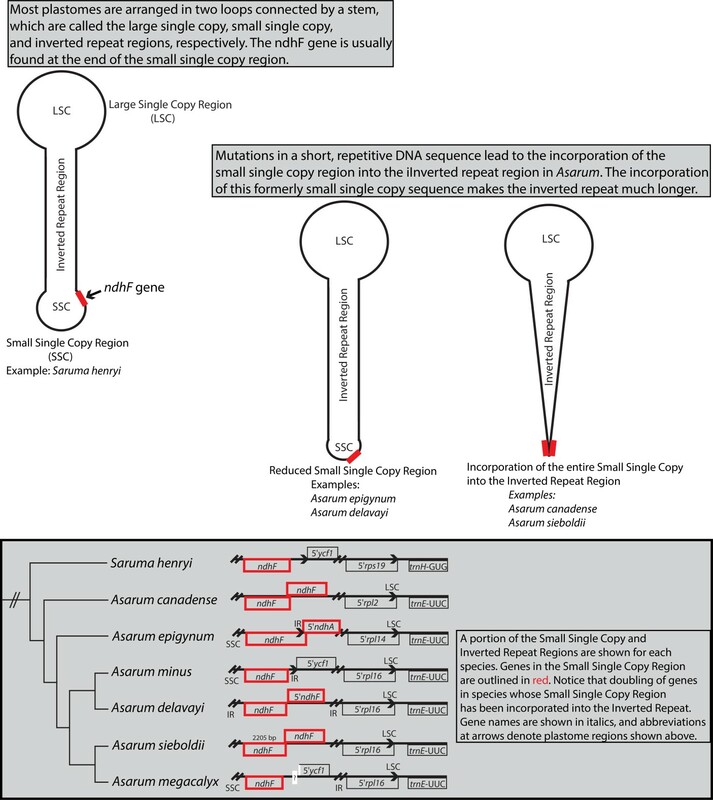 Total duplication of the small single copy region in the angiosperm plastome: Rearrangement and inverted repeat instability in Asarum. American journal of botany, 105(1), 71-84. A few weeks ago Ardine Nelson, Professor Emerita, OSU Department of Art’s Photography program, and Fredrik Marsh, instructor at Columbus College of Art & Design and The Ohio State University, visited our Insect, Fish and Tetrapods collections in order to take photographs of specimens for a new series featuring specimens from EEOB’s Museum of Biological Diversity. 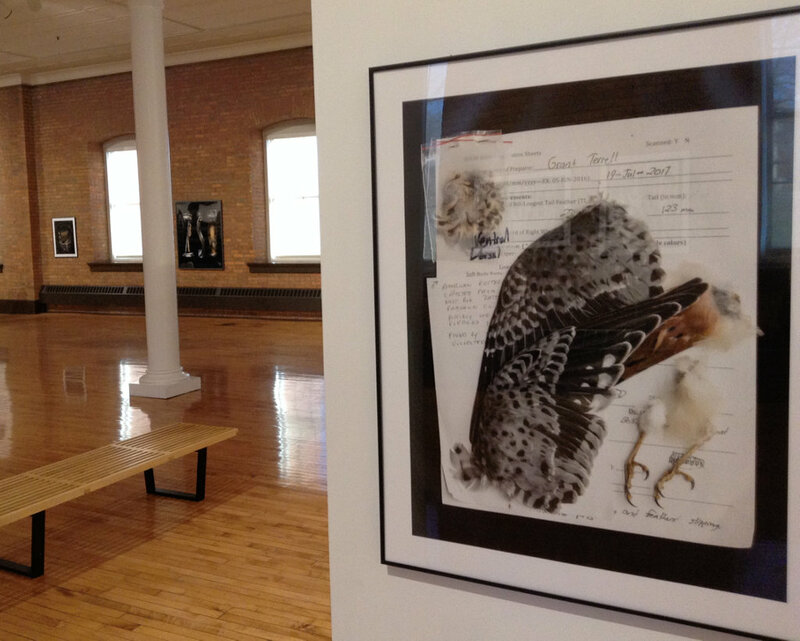 Ardine showcases photographs of specimens, in their drawers, just like they are preserved in the museum collection. Her master piece in this show is The Research Board (last one in this slide show). 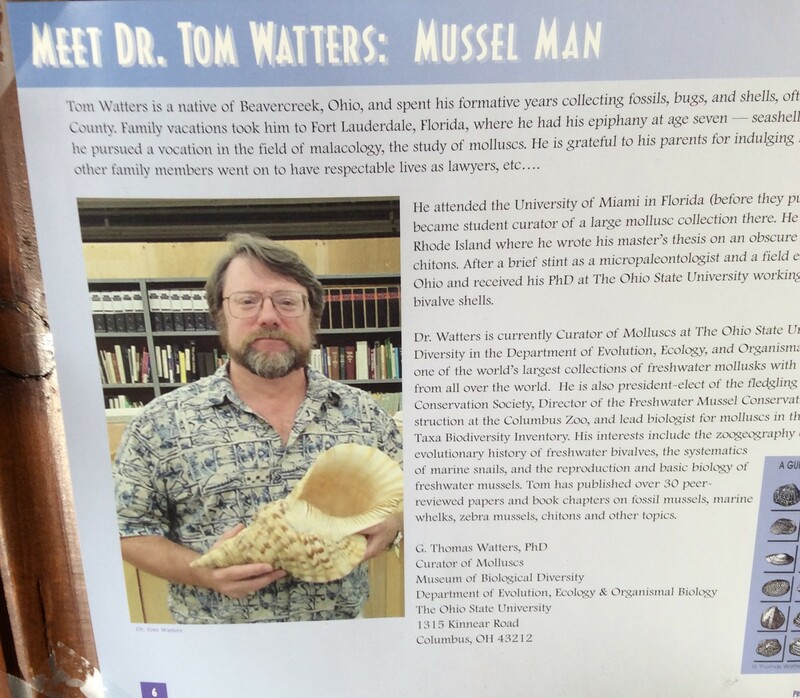 Fred features scans of specimens, most of them larger than life-size. To appreciate the large photographs and scans you have to see them yourself. The first selection is on display at the Fort Hayes Shot Tower gallery where you can admire their stunning art Monday – Friday 8am-5pm until April 27 (Please note, the gallery is closed for spring break March 30 – April 8). More information about the exhibit and the artists can be found through ColumbusMakesArt. A big THANK YOU to the curators of the collections, Marc Kibbey (Fishes), Luciana Musetti (Insects) and collection manager Grant Terrell (Tetrapods) for hosting the artists and providing access to specimens! 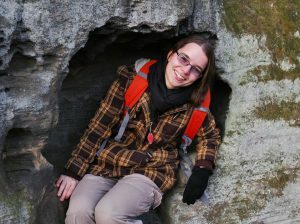 About the Author: Angelika Nelson is the curator of the Borror Laboratory of Bioacoustics and the social media manager for the Museum of Biodiversity. 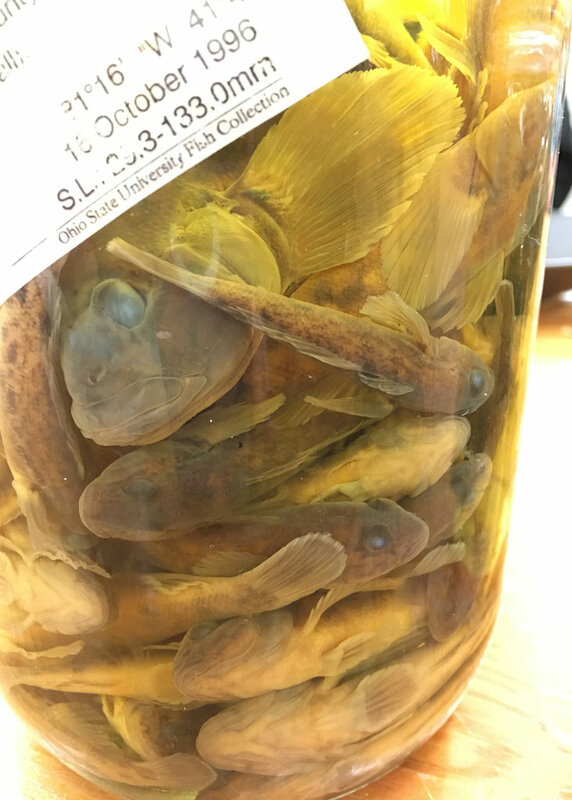 Most of the specimens at the Ohio State University Herbarium (OS) are tucked neatly into cabinets, not on display. But adorning one long wall are what at first glance look like pictures. Artfully arranged, with wood frames and a glass front, a close look reveals they are not paintings but are in fact real, once-living, plants and fungi. The displays are quite pretty and they’re obviously rather old, but I never stopped to consider just how old they are, or how they came to be. A modern interpretive sign explains that they, along with four larger, more intricate panels of Ohio trees, were assembled for display at the World’s Columbian Exposition, a big world’s fair held in Chicago for six months in mid-1893. 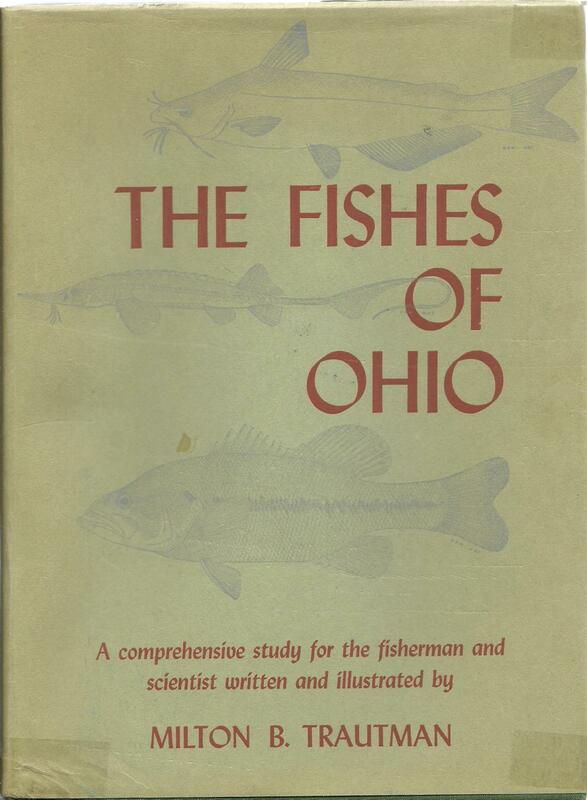 At the top of each 18 x 22-inch panel is a printed heading “Flora of Ohio,” and beneath that, in ornate old-style penmanship, are the words “Prepared by Professor and Mrs. W. A. Kellerman.” William A. Kellerman was remarkably energetic and wide-ranging in his botanical interests. Making these panels was an appropriate hobby for a person whose life revolved around plants and fungi. An Ohio native born in 1840, he attended Cornell University for undergraduate studies and later received his Ph.D. from the University of Zurich, Switzerland. He taught at schools in several nearby US states before returning home to become OSU’s first botany professor and Chairman of the Department of Botany when it was formed in 1891. That same year, he established the Herbarium in a building aptly named “Botany Hall” that unfortunately no longer exists on OSU’s oval. 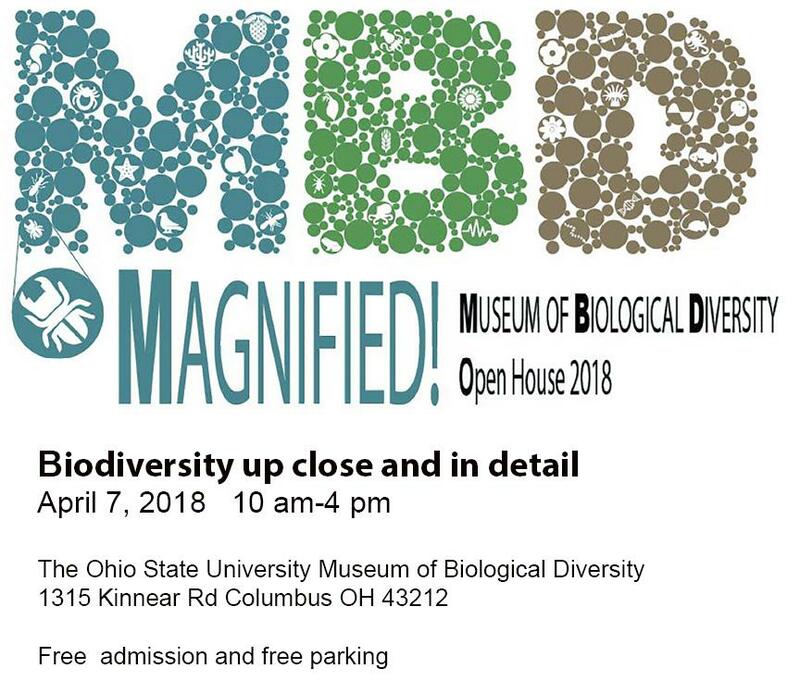 Since then the Herbarium has moved twice, first to the also aptly named “Botany and Zoology” building (now Jennings Hall) and then to its present location as part of the Museum of Biological Diversity on West Campus (1315 Kinnear Rd.). While his principal research interest was rust fungus diseases of crops, Kellerman’s numerous works on the flora of the regions where he lived reveal an extraordinary breadth of knowledge. 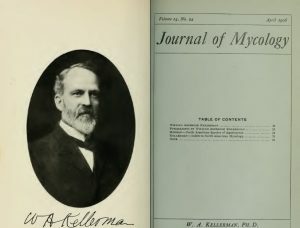 He wrote a guide intended principally for use by teachers entitled “Spring Flora of Ohio” (1895) and co-authored, beginning in 1894 and subsequently updated several times, “A catalogue of Ohio Plants.” Sadly, while Kellerman was on a research trip to study fungi in Guatemala, he contracted a fever (most likely malaria) from which he died in 1907. 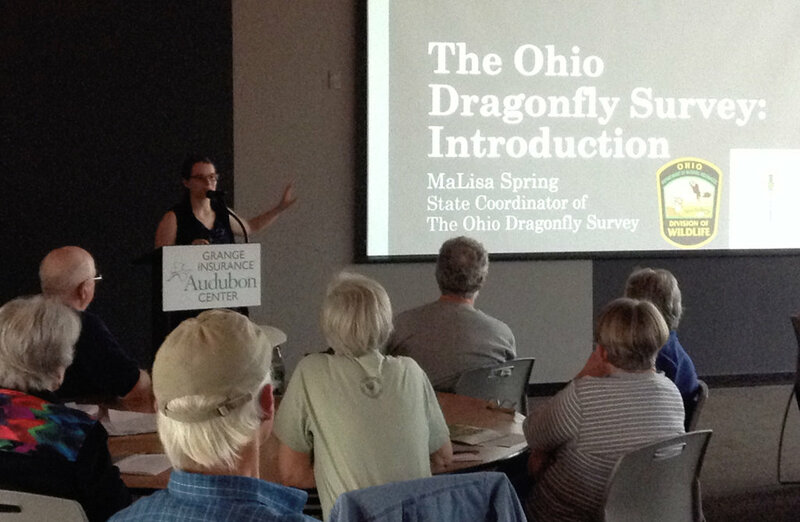 The panels are an interesting snapshot of the flora of Ohio. 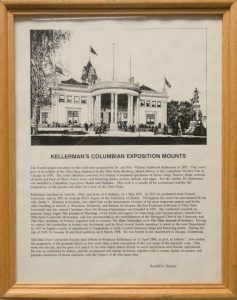 While aesthetics and enthusiasm for particular plants may have played a major role in their selection by the Kellermans, the panels were indeed portrayed to fairgoers as indigenous representatives of our flora. As there have been substantial changes in the composition of our vegetation, especially for such pollution and disturbance-sensitive organisms as lichens, they arouse curiosity about the past versus present status of these organisms. Lichens are dual organisms consisting of fungus plus alga. The algae are single-celled photosynthetic organisms. The fungus, which constitutes most of the body of a lichen, provides a home for the algae, usually in a layer just beneath the surface. 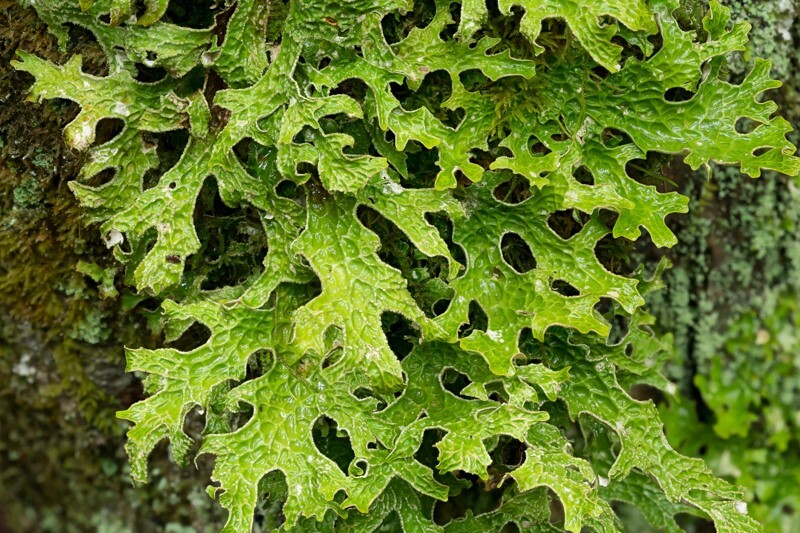 Most lichens fall into one of three growth-form categories: (1) usually small “crustose” lichens that are tightly attached to the substrate and so don’t have a discernable lower surface; (2) small to medium-sized “foliose” lichens that are flattened and can usually be separated from the substrate, and (3) “fruticose” lichens that have a bushy shape, either standing upright from the surface they are growing on, or dangling off a tree branch or trunk. Most of the lichens in the panels are foliose species. 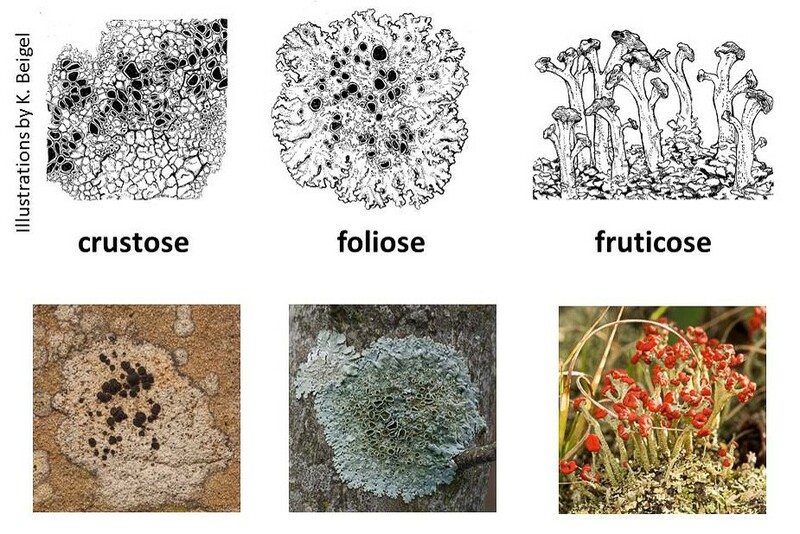 There doesn’t seem to be a strict organization scheme for the lichen panels; they’re not in alphabetical or taxonomic order, except that one panel consists mostly of crustose species, while the few fruticose ones represented are grouped together, sharing space with some foliose ones. I suspect that the paucity of fruticose types is attributable to the display method only being suitable for flat or readily flattened specimens. 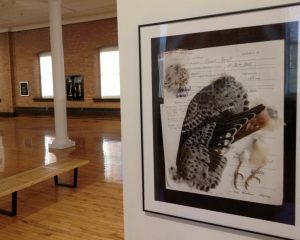 Each panel includes 9 specimens, with handwritten labels. 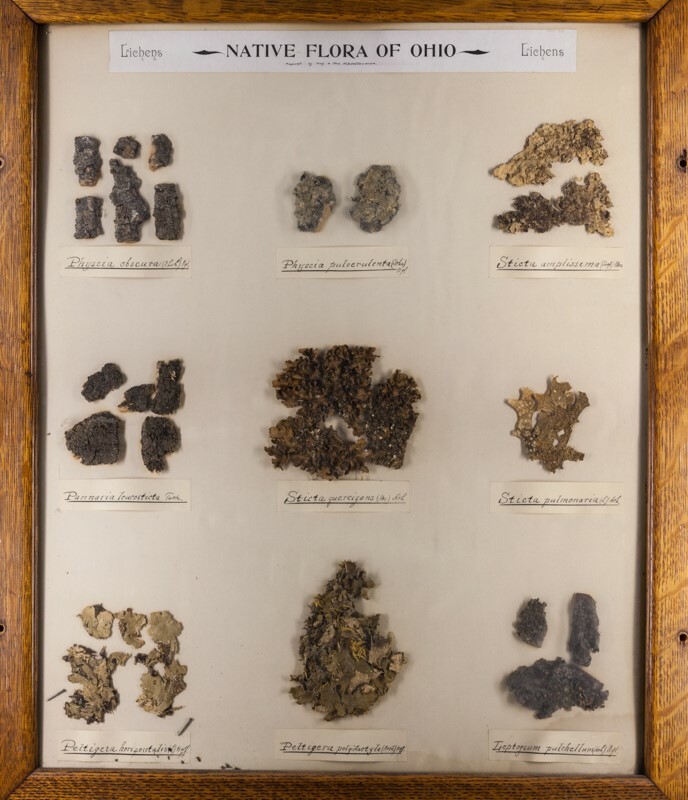 The classification of lichens has undergone substantial change in the past century and a quarter, hence many of the names written by the Kellermans are not in use today. 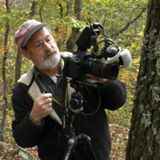 Fortunately, an on-line database called “Consortium of North American Lichen Herbaria” lists specimen records for lichens residing in collections spanning the continent, and the site lists all the names by which a species has been known in the past. 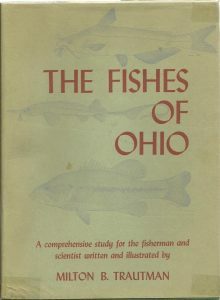 The present distribution of lichens in Ohio is well described in The Macrolichens of Ohio by Ray E. Showman and Don G. Flenniken, published in 2004 by the Ohio Biological Survey, and distribution maps presented on the web site of the Ohio Moss and Lichen Association. The status of the lichens more broadly is set forth in a monumental book, Lichens of North America by Irwin M. Brodo, Sylvia D. Sharnoff and Stephen Sharnoff, published in 2001 by Yale University Press, along with an updated companion volume by Brodo published in 2016 by the Canadian Museum of Nature, Keys to Lichens of North America: Revised and Expanded. One panel caught my eye. This is a group of mostly rather large foliose lichens, including several “lungworts,” members of the Lobaria –robust broad-lobed species found on bark. 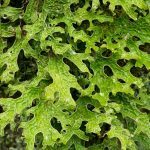 Among the most easily recognized of all lichens, lung lichen, Lobaria pulmonaria, was once widely distributed across Ohio, but no more. All but one of the 14 county records for lungwort are pre-1945, with the other one record being sometime between 1945 and 1965. Extensive searching has failed to find lung lichen today. Why is it lung lichen gone from Ohio? It’s probably due to a multiplicity of factors that prevailed during the late 19th, and early 20th centuries: air pollution and disturbance of old-growth forests. Now that conditions are better for it to grow, perhaps a lack of propagules is keeping it from reestablishing itself. While eventually a warbler or vireo might fly in from some north woods with a little piece of lungwort on its foot, this might be a good candidate for a deliberate reintroduction. This is what lungwort looks like, growing on a tree in Maine. It’s a beautiful lichen and that just might still be growing in in a bottomland forest somewhere in Ohio, or it might soon return. Keep an eye out for it the next time you go hiking! About the Author: Bob Klips is Associate Professor Emeritus in the department of EEOBiology at The Ohio State University. He currently assists with moss and lichen databasing in the OSU herbarium. 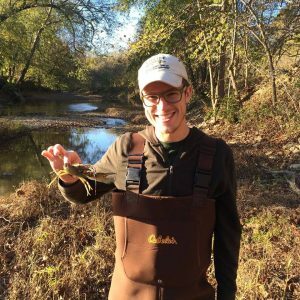 His research focuses on bryophyte ecology. 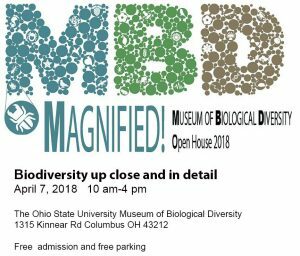 Mark your calendars – we will have our annual open house on Saturday April 7, 2018. 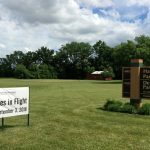 The event will take place at 1315 Kinnear Rd from 10am through 4pm. Following our success form the last years, we will have some kids activities outdoors – as well as plenty of things to do and see indoors. Our motto this year is “Magnified“. Displays will focus on magnifying all small things in our collections. 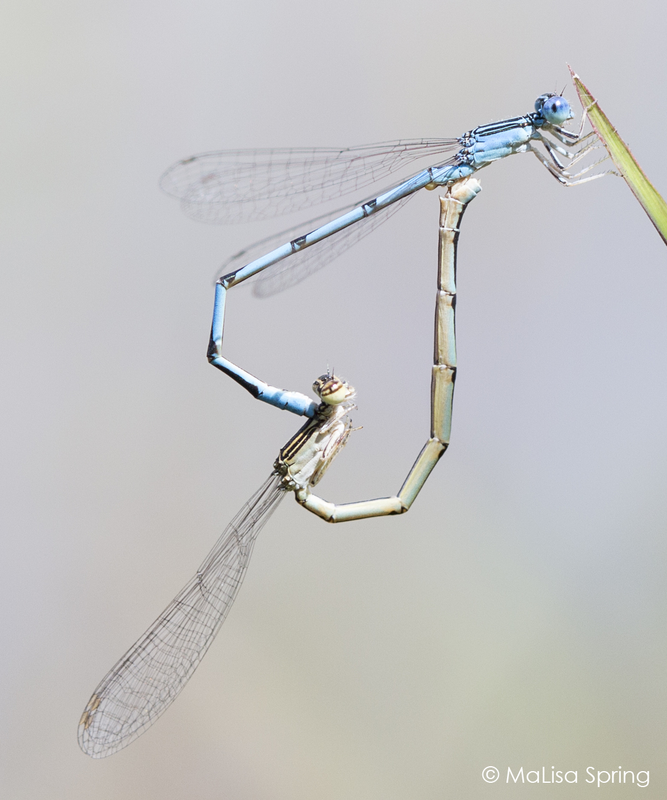 Have you ever looked an insect in the eye? What does the inside of a flower look like? 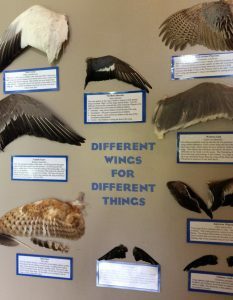 Are bird feathers 3-dimensional? 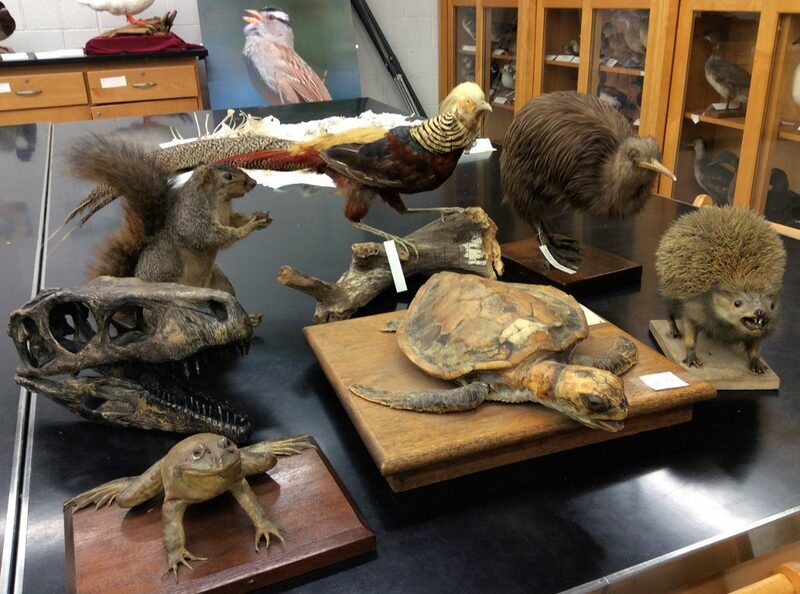 You will find answers to these and many more natural history questions at our open house. To stay up-to-date, please follow us on Facebook or send us a message.